We’ve worked with architects and their teams on countless new and existing construction projects for a variety of applications—and we know there are plenty of factors for an architect to consider when planning for use of a high-density mobile storage system. We’ve highlighted a few of them these factors—for even more insight, we’d encourage you to download our Floor Loading Considerations Brochure. By working with Spacesaver at the beginning stages of a project, we can help you conserve space as well as contribute to a significant cost savings. At the Main Library at the University of Illinois at Urbana-Champaign, the architect was able to fit 55 miles of shelving in 91,000 sq. ft—enough to house the 7 million volumes—instead of the original building plan, which would have made the building 78% bigger. Our Floor Loading Considerations Brochure takes an in-depth look at all of these aspects and more. Spacesaver’s high-density mobile systems maximize square-foot capacity for storage by providing movable storage shelves and aisles instead of fixed shelves and aisles. The versatile Spacesaver carriage, with its welded “uniframe” construction is designed to provide exceptional rigidity and results in minimal distortion and keeps carriage members structurally square and true under heavy loads. The magnitude of a floor-load capacity required will be contingent on what’s being stored. For instance, typical floor requirements for paper files or books will be 125-200 psf (pounds per square foot), while museum applications may require 275-300 psf depending on the number of shelf tiers and type of floor system. The heaviest floor loads can be distributed through the flexibility of Spacesaver’s rail layout, and there are countless options for distributing these loads, simply by adjusting rail placement and spacing. For a high-density mobile storage system, the Impact Area Footprint is the combined area of the storage system plus aisles. Loads from the shelves of the system are transferred to the carriages, which are transferred to the wheels, then the rails, then the structure of the building. Keep in mind that the aisles are subjected to pedestrian loads (15 psf minimum), which must be considered in conjunction with the storage system loads. In terms of rail loads, Spacesaver high-density mobile storage systems are planned with approximately equal rail loads—however, it’s also possible to develop unequal rail loading if conditions are more advantageous. When evaluating floor load imposed by Spacesaver systems, initial layouts may yield conditions that don’t meet your specific criteria. 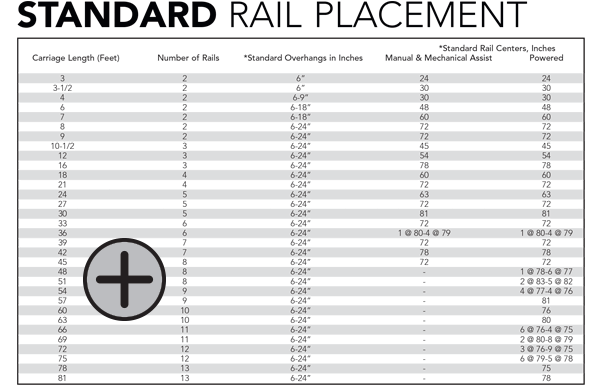 However, Spacesaver’s rail size selections offer a unique ability to be reoriented over load bearing points—so satisfactory loading can be accomplished. Same with relocating a system of a certain weight to a bay’s allowable load capacity—systems can be repositioned over an adjacent bay and an additional rail can be attached so the weight can be distributed evenly. There are several types of structural modifications, supplements, and suspended systems that can be utilized to reinforce the beams and joists that support a high-density mobile storage system. Click here to access drawings of some of the many modifications we’ve seen in the field. All framed floor systems are subjected to deflection when load is applied to the floor system, and the amount of deflection is proportional to the applied load. Buildings with large bays can have enough deflection, which could cause a high-density mobile storage system to drift. Spacesaver has developed a patented positioning brake, which will present a system from drifting. In addition, Spacesaver has also developed patented anti-tip systems that meet all code requirements for buildings in areas that are prone to seismic activity.